Comprehensive cross-references, notes, articles, full-colour maps, illustrations make this an ideal study bible. Text size: 8pt. An excellent study bible - so helpful in understanding the bible better. The ESV Study Bible was created to help people understand the Bible in a deeper way — to understand the timeless truth of God’s Word as a powerful, compelling, life-changing reality. To accomplish this, the ESV Study Bible combines the best and most recent evangelical Christian scholarship with the highly regarded ESV Bible text. The result is an outstanding and comprehensive study Bible — with 2,752 pages of extensive, accessible Bible resources. 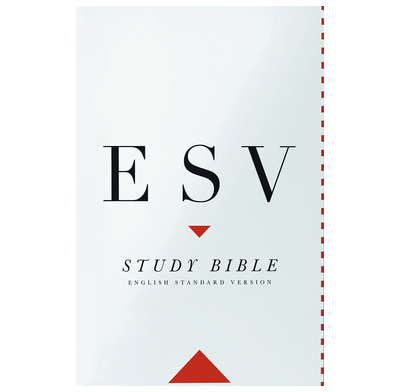 Created by an outstanding team of 95 evangelical Christian scholars and teachers, the ESV Study Bible presents completely new study notes, maps, illustrations, charts, timelines, articles, and introductions. Altogether the ESV Study Bible comprises 2 million words of Bible text, insightful explanation, teaching, and reference material — equivalent to a 20-volume Bible resource library all contained in one volume. Also included in the price is access to the Online Study Bible. This provides the full content of the print versions, plus additional unique features, including the ability to create personal online notes; to search and follow interactive links between notes, maps, articles, charts, timelines, illustrations, and cross-references; to listen to audio recordings of the ESV Bible; and to access additional resources not available in the print edition. – 2 million words of Bible text and insightful teaching in 2,752 pages. – 20,000 notes—focusing especially on understanding the Bible text and providing answers to frequently raised issues. – Over 50 articles—including articles on the Bible’s authority and reliability; on biblical archaeology, theology, ethics, and personal application. – 200-plus charts—offering key insights and in-depth analysis in clear, concise outline form; located throughout the Bible. – Over 200 full-color maps—created with the latest digital technology, satellite images, and archaeological research; printed in full color throughout the Bible. – 80,000 cross-references—to encourage easy location of important words, passages, and biblical themes. – 40 all-new illustrations—including full-color renderings and architectural diagrams of the Tabernacle, the Ark of the Covenant, Solomon’s temple, Herod’s temple, the city of Jerusalem in Jesus’ time and throughout the history of Israel, and many more. The ESV Study Bible is the finest study tool I have seen in fifty years of Bible teaching. The notes, articles, maps, and illustrations are all of the highest quality. It is a great achievement! Excellent service, packaging and delivery but the book was a gift for someone else so have not read it myself. Thank you. This is a comprehensive aid for Bible study. As a very new Christian I have found the extra resources to be helpful and clear. My understanding of the Bible has been much enhanced. This is without doubt the best study Bible I have ever come across in 35 years of preaching/teaching- even better than the McArthur Study Bible. One word sums it up - SUPERB! The notes are soundly evangelical and orthodox as well as being useful and spiritual in application. There are simply hundreds of clear and brilliantly put together maps, charts, diagrams, time-lines etc etc. There are also scores of in depth articles covering subjects of doctrine, Christian history and the Bible (both from an historical and cannon point of view). If your house burns down (God forbid) and you can only get your hands on one book in time - make sure it is this one. It is a one volume evangelical library. As it advertises there is a wealth of maps, diagrams, notes, charts tables etc to help better understand the biblical text It is also very nicely presented. However it is very biased indeed. It is advertised as evangelical but is of a very much reformed position and makes this known at every possible opportunity. For me a study bible should not interpret the text in this way as it leaves no room for other possibilities. It simply declares outright that this is what the text means. I'm not sure how helpful this is then as a resource. For me a study bible should shed light on the text using history, archaeology, knowledge of original language etc. Giving the reader the tools to better understand a passage. It should not, in my opinion interpret every passage for the reader. If you are of a reformed persuasion I'm sure you will love this bible but for me it is far less useful. A great reliable Study Bible supplemented with an overview,articles,resources, concordance and much more.The study notes are a little on the small side for any with poor eyesight. Otherwise, excellent. Notes are clear and understandable. Maps in each section very helpful. Introduction to each book useful in terms of placing the book in it's historical context. On-line access an added bonus. I treated myself to this bible for my birthday! I had previously read portions of the ESV on-line and liked it very much for its clarity. I now use it every morning. What I have seen of the notes so far are helpful. My one observation is that some of the references are in very small print, which I don't always find easy to read. I purchased this to help me prepare for one to one sessions, small group and the very occasional sermon. It is a valuable reference and amazing value for the price. Not only are the study notes helpful, there are very useful introductions to all the books of the Bible and really helpful articles such as the views on different cults. Gaining free access to the same material on line is also a plus. Although bulky, the ESV Study Bible provides an invaluable resource for anyone wanting to take seriously the study of the Bible. Very clear, and as a translation very suitable for public worship and private study. As a study Bible I am very pleased with it as a resource.